With summer in full swing, it would be a shame not to showcase the jewels of the harvest: berries! As it turns out, making a juicy berry pie is easier than it looks since a berry-based filling requires minimal prep work. Just pick your favorite combo (see below), or choose whatever looks best at the market that day, and stir it all together! Also, if you’ve never made your own pie crust, give it a try. It does take some practice to get the consistency and rolling down but I promise it’s well worth the extra effort. Preheat oven to 350. In a large bowl, combine flour and salt. Separately, combine vinegar and ice water. Cut the shortening in grape-sized chunks into the dry mixture using a pastry cutter. Begin adding water to the dry mixture, 1-2 Tbsp at a time as you use the pastry cutter or your hands (take your rings off!) to work the shortening into the flour. Continue adding water until all the flour is worked in and dough holds together but is not sticky (you may not use all the water). If dough gets too sticky, dust in more flour. Divide the dough into 2 balls and place each ball between 2 sheets of floured waxed or parchment paper. Roll out each ball with a rolling pin until it is flat and large enough to cover a pie dish. 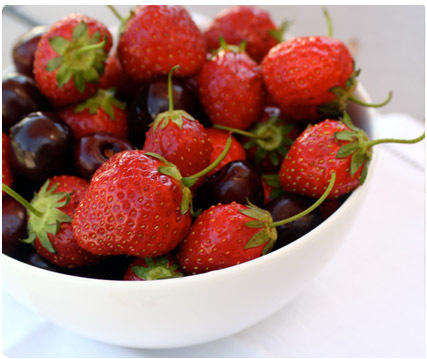 Wash and remove stems from berries as needed. If you’re using strawberries and rhubarb, chop into small pieces. Combine fruit in a large bowl. In a small bowl combine sugar, flour, cinnamon and nutmeg. Stir well. Add in eggs and vanilla and beat with a whisk to combine. Pour filling over fruit and stir gently so as not to mash the fruit. 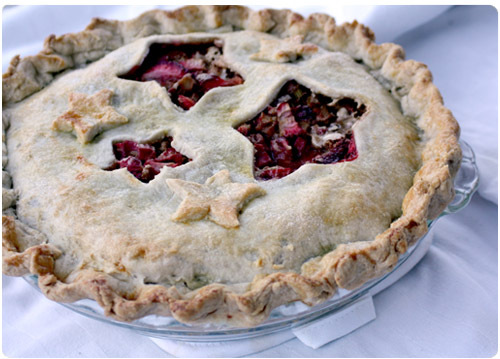 Place one rolled crust in the bottom of the pie dish and pour in the fruit filling. Gently place the second sheet on top. Pinch together the edges of the two crusts using your thumb/forefinger and other thumb to push the crust into a “U” shape. Use a knife to slice small vents in the top crust. In a small bowl, beat one egg. Baste egg wash over the crust. Sprinkle crust with sugar. Bake for 55-60 minutes or until crust is golden brown. Serve with fresh whipped cream or vanilla ice cream.